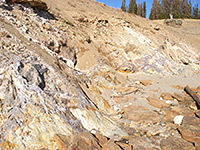 The easy and popular 2.3 mile loop hike to Storm Point on the north shore of Yellowstone Lake is rather different to most in the park as the path encounters no mountainous scenery and no thermal features apart from a few minor steam vents; instead it crosses forest and grassland to a strip of sand dunes, beaches and a rocky promontory, a landscape more typical of the California coast than this high altitude location in the middle of the Rocky Mountains. The point is quite exposed and as its name suggests often suffers from wet and windy weather, but on a calm summer's day it is an ideal place to have a picnic or relax for a few hours. The hike offers a good chance of spotting wildlife, in particular birds along the shoreline, yellow-bellied marmots on the point itself and bison in the woods and meadows. Grizzly bears are often present in early summer, and sometimes cause the trail to be closed for a while. Similar scenery is found along the shorter Pelican Creek Trail, starting along the highway 2 miles west. 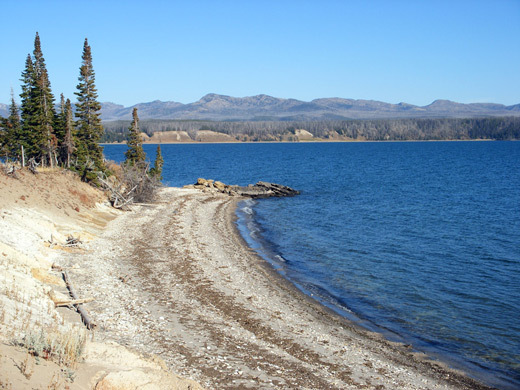 Parking for the hike is at a pullout along the main road around Yellowstone Lake, 3 miles from Fishing Bridge and right next to Indian Pond (originally named Squaw Lake), which like nearby Turbid Lake is a flooded crater, formed by violent volcanic eruptions a few thousand years ago. The low ridge around the pond (on the east side) was once the crater rim. 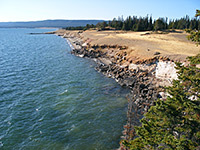 The path crosses a grassy plain alongside the pond and leads through a thin strip of lodgepole pine woodland to a sandy beach at the edge of Yellowstone Lake, then re-enters the forest, now quite dense and dark, and follows close to the shore south towards the point. 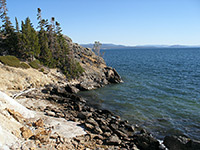 The trees fade away near the end, and the terrain rises slightly to a rocky headland 30 feet above the water. 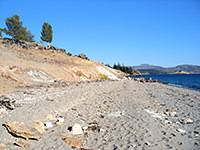 Waves break forcefully against the cliffs below, and sand/pebble beaches stretch to the east and west to create a typical seaside scene, especially since the far side of the lake is so distant. 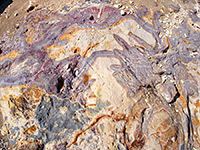 The path continues westwards staying close to the water's edge, just above the beaches, and turns inland again at a geologically interesting area with several fumaroles and a strange section of multi-colored clayish rock containing twisted bands of purple and green minerals. Once away from the shore, the trail runs through pine woodland once more, all undamaged by wildfire and composed of a healthy mixture of young and old trees, though still with many old fallen trunks, result of a huge storm long ago. 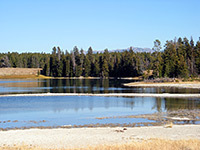 The loop hike is completed by a short section across the tall grass meadow, back to the edge of Indian Pond. The woods and meadows have many bison tracks and wallows, and the animals are often seen either close to the lake or a little way north in the more extensive grasslands around Pelican Creek.